Wireless 16 Button Backlit Remote Control – Operate your adjustable base by a remote, that can raise or lower your head and feet independently, or together. The Flat Button lowers the bed with a single touch. 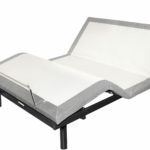 Ease aches and pains and relax in comfort with full range head or foot positions, accommodate any sleep position. Raise your head to reduce snoring and relieve neck tension. Operate your adjustable base by a remote, that can raise or lower your head and feet independently, or together. The Flat Button lowers the bed with a single touch. During a power outage, the battery backup feature lowers the bed to a flat position with the touch of a button. Allows you to keep your current wood or metal side rails. Simply put the lifestyle base into your current side rails. 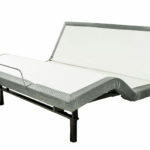 The gravity release safety feature lowers the mattress by gravity, never powering downwards to minimize pinch points. One touch button that raises the legs slightly above the heart to promote circulation and relieve pressure off of the lower back. Quick and easy one touch flat feature to lower your lifestyle base to a flat position. 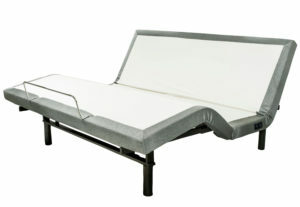 Upgraded Models are supplied 4” or 8” legs that can be configured as a low profile bed or normal height. Engineered with “zero-clearance” to allow your lifestyle base to sit on top of your platform style bed base. Getting up at night just got easier with the LED Under-Bed Lighting. With the touch of a button, the LED light will turn on and illuminate the underside of your base. Relax and recover from a long day with a full body massage. The motors are ultra quiet while providing a total body massage. Allows you to adjust the speed of the massage motors for maximum control of your of your total body massage. Using wave motion will oscillate the massage motors from head to foot, for added soothing sensation. The Pulse Sensation Feature adds a total body massage option while The Pulse Sensation Feature adds a total body massage option while relaxing in your own bed, the pulsing provides a deeper tissue treatment. Dual USB charging outlets per side to recharge your electronics while you use them or during sleep or to keep them fully charged when in use. Keep devices close by and fully charged when you wake. With the touch of a button you can be in the preset TV mode and comfortably watching your favorite show. With the touch of a button you can be in the preset Lounge mode to relax and read a book or surf the web. Program two additional favorite positions into memory for instant recall. With the touch of a button you can illuminate your path in a dark room for safety. Each Comfort-N-Motion lifestyle adjustable base is finished with an upholstery grade fabric that cleans easily and will provide years of satisfaction. Available in Graphite as the standard color offered on most models. Each Comfort-N-Motion lifestyle adjustable base is finished with an upholstery grade fabric that cleans easily and will provide years of satisfaction. Available in Mocha on a special order basis only. Head board brackets are compatible with most standard bed frames. Or, you can use your existing headboard and footboard and simply place this lifestyle changing adjustable base inside your existing rail system. Heavy-Duty steel frame for max lifting that’s evenly distributed according to size. You can rest assured with the 20 year premium limited warranty that comes standard with in-home service.